The dream of a restored canal between Melksham and Lacock has moved another step closer to reality. The former Wilts & Berks Canal was abandoned more than a century ago and much of the original line was lost under modern development. However, in recent years the Wilts & Berks Canal Trust has submitted plans to build a new link from the Kennet & Avon Canal at Semington which would allow boats to travel through Melksham town centre using the River Avon instead. Now the charity has purchased land on the northern edge of the town as part of its ‘Destination Lacock’ project, which aims to restore the former towpath all the way to the National Trust village. The newly-acquired six acres near Queenfield Farm, when combined with landowner permission to access adjoining fields, will allow the Trust to work on 1.5 kilometres of the former canal through open countryside. The charity now hopes to recruit additional volunteers to help with clearing, restoring and maintaining the site, which lies between Lower Woodrow Road and the River Avon. Dave Maloney is the chairman of the Melksham, Chippenham & Calne branch of the Trust. He said, “This is another major step towards achieving the charity’s vision of restoring the Wilts & Berks between Melksham and Lacock, and we’re sincerely grateful to everyone who supported our fundraising efforts to acquire the land. “Our first task will be to remove dead trees and abandoned outbuildings and then we can start work on the original line of the canal. “There’s currently no public right of way and much of it is overgrown, but the towpath remains visible and there are several sections which are still in water. “We’d like to create a new work party of volunteers with a specific focus on Queenfield Farm. Tasks would include grasscutting and clearing undergrowth. “We’d love to hear from people of all ages and backgrounds. It’s a great way to enjoy plenty of fresh air and exercise, while making new friends and learning more about our local heritage. 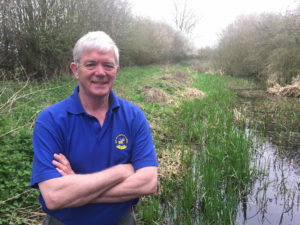 “In the short term, a restored towpath would provide a safe route between Melksham and Lacock for walkers, runners and cyclists, but the Trust’s longer-term aim is to fully restore the canal as there would be massive benefits for local tourism and employment if we could link the town to one of the region’s most popular attractions. “It would also create a new wildlife corridor, providing valuable habitats for lots of different species of birds, mammals and other creatures. The aim of the Wilts & Berks Canal Trust is to restore the waterway from the Kennet & Avon Canal near Melksham to the Thames & Severn Canal near Cricklade and the River Thames near Abingdon, connecting Chippenham, Calne, Royal Wootton Bassett and Swindon. and knowing my right’s I kept using the path on queenfield. Much to the annoyance of the so called farmer. .When he for the 3 rd time ripped down the footpath sign I contacted the police and council. Only to be told he had mental health issues. Was dangerous and had threatened officer’s wìth guns . I still walk this path .I’m sure the old posts are still there wìth the footpath signs missing. Which is very sad. I wonder what the value of the works let to a contractor would be?